Colors for Hope has (rightfully so) received a lot of press and media coverage in the past few weeks. For those of you that are already our facebook “fans” – we thank-you for following us and for believing in our efforts. We only act as the vessels of delivery for these beautiful children and the Hope that they inspire. We promised our little fighter, Clinton that we would carry on, and that we will do. Kim presented the information to the Clinton’s Club executive board and we agreed to sponsor Colors For Hope. 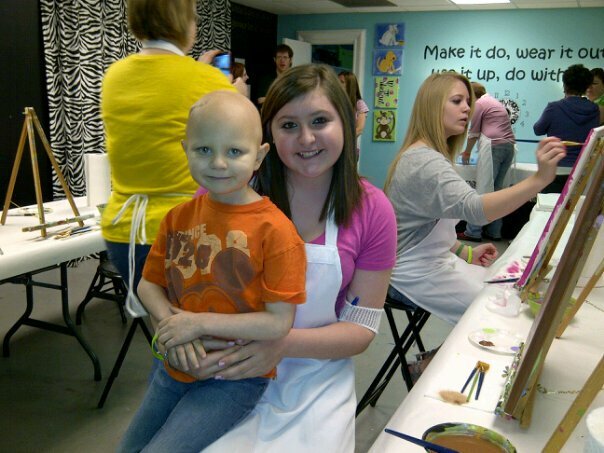 Colors for Hope was inspired by a spoken wish from our Tay (Taylor Filorimo) to Clinton’s Mom, Kim. Tay wanted to create her own nail polish – and she even knew what specific shade of Lime Green she wanted. This girl knows what she wants! Kim has the incredible ability to just make things happen. Kim did all the background work to make this wish come true for Tay, and the rest of us struggle just to keep up! Tay’s Color For Hope is Lime Green and is aptly named “Pray 4 Tay” – as this has been her personal campaign all along. If you know Tay or have followed her story, you will see that this is not just a quote from her, but the way she faces every day -“I will NOT let the FEAR of cancer STRIKE me out”–Taylor Filorimo. Our Clinton loved his Tay as does everyone who meets her. To learn more about Tay, watch this video that tell’s Tay’s story and if you haven’t heard it ~ you should listen to it – it’s her song – “She’s a Hero – Tay’s Song” http://www.youtube.com/watch?v=hfNh2LSCNP0&feature=share. Here’s a photo of Clinton and Tay that was taken last March. Now – here’s the great part – we launched the sale of our original order and were completly blown away by selling out 100% of our inventory in under 4 hours. We had not even completed our press releases – this was all acheived through social media alone. We have tried to keep the associated costs very low because we want our administrative costs low and our giving dollars high. We have many orders that have been sitting waiting to ship out as soon as the product arrives. We expect arrival date to be Monday, May 21st – so if you have not received your order – it’s on it’s way – we promise. We sold all over the United States – and then went global with orders from England, Germany and South Africa. Amazing! You may order one single bottle of any color – for $8. The entire set of all 10 colors is now $70 (the inaugural set pictured above had 9). Let me explain some of the confusion on shipping. The shopping cart on our website adds $5 shipping for each order. So, if you order 4 Ninja Blues it will automatically add $20 shipping. If you need multiple bottles of one color – please email lori@clintonsclub.org and we’ll create a seperate invoice and send it to you via paypal. To place an order – visit our website www.clintonsclub.org and click on the second tab – Colors For Hope. So what are we doing with the money? 100% of the proceeds will stay with Clinton’s Club to be used for all kids with cancer in our area. So far, we have sponsored events and provided media coverage and assistance for other events in our area – but we are mostly still in fund-raising mode. We have not spoken this publicly – but we are saving every penny that we can (donations, yes – we’ll take them!) because it is our dream to open up – Clinton’s Clubhouse on December 17th on what would have been Clinton’s 8th birthday. We are praying this will happen and the funds will be there. We know the property we want, now we just have to wait for it to all work out! Clinton’s Clubhouse will serve as a place where Cancer kids and their families can come for fellowship with each other, counseling and classes – as well as fun things – such as camping and “feeshin”! We have plans for art classes, Mom’s Day out, etc. We are working on room sponsors and so many other things – it will make your head spin! Thank you- thank-you for your continued support of us!